On His Terms: Riverhorse Cafe! | Delicious! Delicious! On His Terms: Riverhorse Cafe! Caryn is rolling, rolling and folding a puff pastry dough. But it’s not quite working as well as she’d hoped. Mr. R. paces the trailer, mumbling lines to himself as he rehearses from his script. There is an icy chill in the room and it’s not from the snow-capped mountains outside the window. He speaks to Caryn without a pause in his recitation. Is that for dinner tonight? Caryn shoves the rolling pin aside. I guess. If it turns out. She attempts to mold the dough with her hands. Do you have plans again tonight? Um, yes. Well, if it’s okay, I’d like to drive into Park City and maybe grab dinner there. If it’s okay with you, of course. He begins the pacing and mumbling again. Caryn stares at the dough, unsure how to proceed. Maybe I’ll come with you. She looks up at the suggestion, but her approval is irrelevant to him. She returns to staring at the dough. After a second, she wads up the whole buttery mess and dumps it in the trash can. The perfect evening to sit on the open balcony above Main Street. Caryn is finishing a summery salad garnished with roasted peaches and goat cheese, but she is eyeing the last bites of Mr. R.’s shrimp wrapped in jack cheese and bacon, drizzled with a chipotle cream sauce. The other diners seem to be happier than the awkward pair of chef and employer. The plates are promptly cleared. The table is reset for the main course. Mr. R. picks up the book he brought with him. Caryn watches the table next to her talk to the restaurant’s chef. She is rescued from her solitude by the arrival of the entrees. 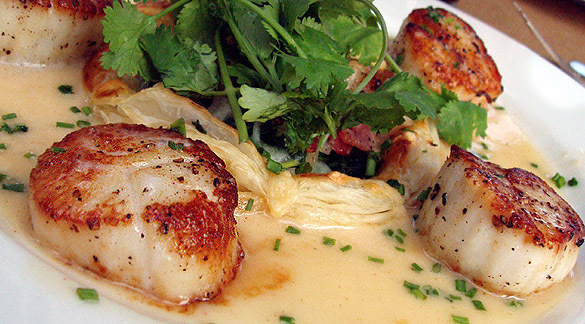 On Caryn’s plate, the freshest scallops available swim through a lemon-cilantro butter sauce. She picks up her fork and pokes at the potato pastry in the center, sorting through the delicate layers of flaky dough. Mr. R. puts the book down to start on his stunning lobster tail curved beside a bank of pasta with sundried tomatoes, mushrooms and basil. Caryn slices through a scallop and tastes it skeptically. Mr. R. hides a smile behind his fork. Without asking, he reaches over and grabs a scallop from Caryn’s plate. Her mouth drops, but he quietly trades the scallop for a slice of the tender lobster. It has been many years since my first visit to Riverhorse and I was so pleasantly surprised to find that the service and food is still outstanding. A wonderful meal. Summer hours vary but aim for a sunset. Horrors! Reading at the dinner table in a restaurant! What can Mr. R be thinking? Caryn is too good for him. I think I’m intrigued by their relationaship because I can’t fathom NOT talking about food while eating it. The scallops look delcious. How do you take such a lovely pic? God, that looks great – you take such awesome photos. I feel like I’ve missed something in the story though…why has she been so miserable lately? Is she just homesick or does she hate the gig? I can’t figure out if she even likes Mr. R on a basic level to begin with. He seems to treat her well and with respect, yet she seems so unplussed by the whole situation. I guess I’ve just been getting into this whole thing a bit too much. It’s because she went out with friends without telling him, that he is being such a turd I am thinking. Typical. LOL. I love that picture. I am now hungry. Thanks. I heartily agree – how gauche, reading at the table at a restaurant (morning paper at home notwithstanding). Mr R’s feathers have evidently been ruffled by Caryn’s night out! Now for the food; how very delicious that looks. I have an utter weakness for scallops, especially when seared so beautifully. The sauce looks the perfect consistency. Gosh, y’all are my best friends! You understand me so perfectly! Yes, leanwoo, tara and AmyBee all hit on stuff that annoys the socks off of Caryn. I usually don’t order scallops, but the waitress insisted that these were the best I would ever have. And she was right. They were fantastic! For the record, pictures in restaurants are luck of the draw for me. Many a great dish never makes it to the blog because I’m just too shy to snap a picture or the lighting isn’t right. Thank God for the open balcony at Riverhorse! Mmhh….Those scallops look so good.